Look at me posting without being involved in a current Style Challenge!! It's going to be a quick one because, quite frankly, it's been a long week (and it's only Wednesday - well, technically Tuesday night but you know what I mean). if I look a little stunned, keep in mind, these pics are all pre-coffee! See the necklace in pic #2??? My new rose gold chain necklace c/o the lovely ladies at myfemmecrush - stay tuned for a whole post on their awesome jewelry in the coming week! I'm (clearly) still loving pants/jeans with color! This love/trend will definitely carry into fall. I'm confident I'll continue to love my red jeans and have added a burgundy pair to the mix! And then there's my beloved print pants (thank you Old Navy) have remained in the rotation. I never thought I'd wear, let alone like, print pants! What are your favorite fall fashions/trends/colors??? I need shopping ideas!! 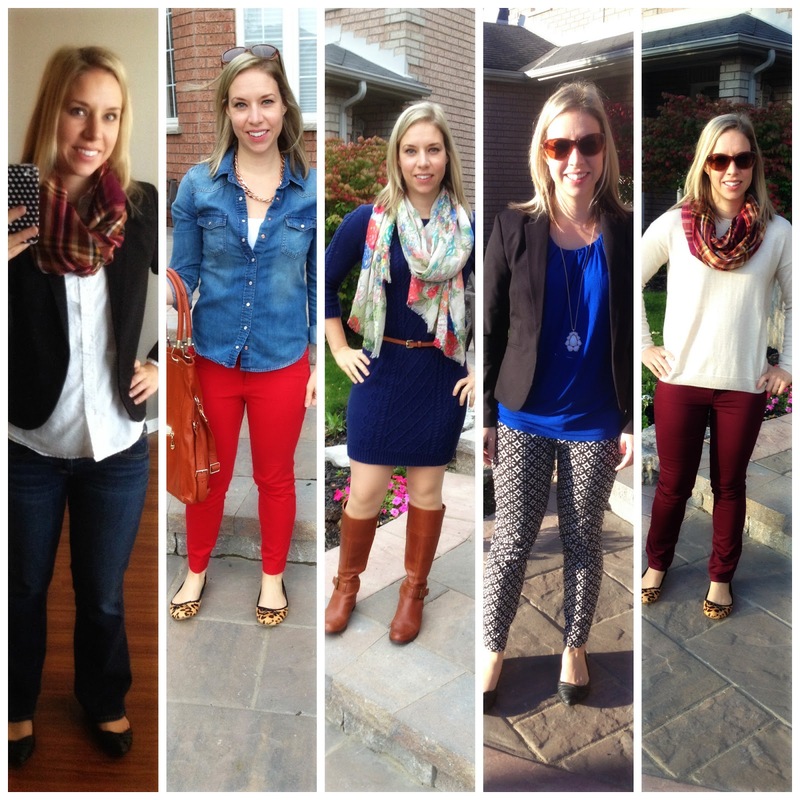 I need more coloured jeans-love all these looks on you!! You are so well put together & look super cute. yes you do!! They are by far my most favorite addition to my wardrobe! All of these are great work outfits! Love the blue dress with the scarf and the burgundy pants with the leopard flats! My favorites (although, it is hard to find a favorite, because I like them all!) are the third and last outfits! I have a pair of wine colored coords that I got late last winter from BR Outlet that are similar to that color and I can't wait to get them out of the closet again. You look great for work! well you'd better get those cords out!!! Of course, my dear...you look fantastic! Love that plaid scarf. Can't wait for the challenge! Love all of them. I think you're going to have to change your blog name from frumpy to fashionable. You look great! hahah I've had the name change suggestion a few times but I think that ship has sailed by this point... it seems like so much work! I guess I'm hoping I'm technically not that frumpy anymore (at least not during the work week) but it is a constant struggle! You are making me excited for fall clothing! I NEED the list to come out as I'm busting out of all my clothes but don't want to buy maternity goods until I know what Alison has in store for us. YAY fall challenge! AND I'm so so looking forward to seeing your little bump in fall duds! If Alison gets sick you can take over the Style Me challenges! I will have you know that I purchased a pair of printed Pixie pants at Old Navy this week - my first pair of printed pants ever - all due to your inspiration! :) They might even make an appearance on my blog. YAY print pants!! you'd better post pics!! Thanks Leeann! love that we have similar tastes! Yay for burgundy pants- that's an awesome combo! loving the fourth outfit a lot! all of them are great though.